Northern Ireland manager Michael O'Neill. Pic by Pacemaker. Gareth McAuley’s inclusion in the latest Northern Ireland squad stands in many ways as the most significant name of the 25 selected - even if the 38-year-old may not kick a ball against either Bosnia and Herzegovina or Israel. McAuley remains without a club following his West Bromwich Albion departure but manager Michael O’Neill had no hesitation in turning to the national favourite for his latest panel. “The reality of the situation is I have included Gareth for a number of reasons,” said O’Neill. “He is a massive player for us, he’s been training on his own which I think is very difficult for a player. “I’ve kept in regular contact for that time and we’ve had numerous conversations with him and with other clubs about him. “It’s important for Gareth to be in this squad. But is it realistic for me to think Gareth could play in these games? “That is something I’ll determine before the Bosnia game and then the friendly against Israel but it is important to have him in the squad and it’s important people don’t forget about him. “People will maybe look at his age as a deterring factor, I know what he’s capable of and I know what his fitness levels are, going forward for me he is still a massive player. “Hopefully, people will recognise that and hopefully, sooner rather than later, he’ll make a decision on his club situation. “He isn’t insured, that’s his own situation, as an association he can’t insure him. “When you’re out of contract, you’re always at risk, you could pull your hamstring going out for a run. “There are loads of things you have to consider but Gareth, athletically, is fine and we manage him very carefully. “When you’ve been training on your own for a long time - and I’ve had that as a player - it is brilliant to be back in and around players again, training with the ball. O’Neill’s sense of loyalty to a player who has given so much in service to his country over a stellar career is supported by more than affection - with an acceptance of the hard reality of life with limited options but the enhanced standards generated off past progress. “There has to be an element of loyalty from me to the players as well,” said O’Neill. “But the reality is that if I had six players in the Championship playing in Jamie Ward’s position then I probably wouldn’t pick him. “If we had two more centre-backs, maybe I’d say to Gareth, ‘You have to sit it out’. “It’s a balancing act, I have a responsibility to help the players at this time in their careers and that’s what we’ve tried to do with this squad. “It’s what we did in the summer, bringing Gavin Whyte to central America and it raises his profile. “Partly as a result of that, and obviously what he’s done at Crusaders, somebody comes in for him. “It helps him along and it also strengthens your squad. 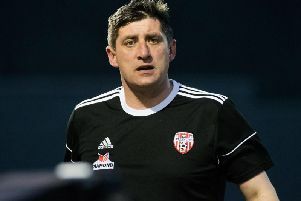 “There’s a balance between where we are – we need those players, Gareth and Jamie still have something to offer – and equally we need Jamal Lewis, Gavin, Paul Smyth etc to fast-track their way up a level in club football so that we know they could come in consistently. “We did think about Gavin, at the time I put the squad together he hadn’t played a league game, oObviously he has played in the league this week and I’ve seen his two goals. “He took them very well, he is very much in our thoughts, we didn’t bring him away in the summer not to be in our thoughts. “But this is a group who got to the World Cup play-off and the finals of the European Championships so you should be playing more than a couple of games in professional football before you get into it. “There has to be an element of competition. In a week in which Chris Brunt confirmed his retirement from international football, future fixtures offer O’Neill an opportunity to integrate fresh blood with a view to continued development within continual evolution. “Paddy McNair is very much an option at centre-half – if Louis van Gaal can play him there for Man United I’ll have to consider it, of course he is,” said O’Neill. “You look at our situation – Jonny (Evans) and Craig (Cathcart) are obviously playing at the top of their game in the Premier League. “We know Gareth’s situation, Aaron (Hughes) came off at half-time for Hearts, we hope he’ll be OK – but Aaron are Gareth are both 38, they’re not going to go on for ever, so it leaves us vulnerable in that position. “It’s probably not Paddy’s preferred position, it’s a position he’s not played in for a while, after that we’re a bit light. “We don’t have a young centre-back playing in the Championship, for example, our next would probably be Tom Flanagan, who’s injured at Sunderland. “That’s where we are personnel-wise at this moment in time, that’s why it’s so important that those older players are still with us, because they buy us a bit of time for, hopefully, new players to emerge. “Jamal Lewis, unfortunately, missed the summer due to a groin problem and minor surgery so it’s good to have him back in. “But these are boys as well, Jamal could easily be with the under 21s, so we have to be realistic. “He’s played, I think, maybe 20 first-team games over the course of this season and last, so we have to give them time. “In relation to that position (Chris Brunt), Daniel Lafferty would be another option, but he has played very little over the last 18 months at Sheffield United. “So, there’s a real opportunity for Jamal to come in make that position his own, we really liked what we saw of him against South Korea and I think he’s a player with a big, big future. “I watched Bailey Peacock-Farrell on Saturday for Leeds United and he was excellent, he has done well there especially with a coach of the standing of Marcelo Biesla coming in. “The fact that Leeds haven’t found the need to go and sign an experienced goalkeeper is good for Bailey. “Michael McGovern knows it is difficult if you are not playing over a long period of time. “English football is different because years ago you were playing the reserves every week, I know Michael is very keen to resolve that situation but he is contracted to Norwich. “It is good that both Trevor Carson and Bailey are playing. With Kyle Lafferty’s transfer to Rangers grabbing the spotlight, O’Neill was able to reflect on welcome positives on the striker front. “Will Grigg is back in the squad and we had someone watching him against Aston Villa when he scored two goals,” said O’Neill. “Liam Boyce has got off the mark for Burton. “Reports on Conor Washington were good from the other night and Josh Magennis has had a great start, scoring goals for Bolton and starting every game. Northern Ireland kick off the UEFA Nations League on Saturday, September 8 against Bosnia and Herzegovina at the National Stadium before the home International Challenge Match with Israel the following Tuesday. NORTHERN IRELAND: Michael McGovern, Trevor Carson, Bailey Peacock-Farrell, Aaron Hughes, Gareth McAuley, Jonny Evans, Craig Cathcart, Conor McLaughlin, Paddy McNair, Michael Smith, Jamal Lewis, Steven Davis, Niall McGinn, Oliver Norwood, Corry Evans, Shane Ferguson, Stuart Dallas, George Saville, Jordan Jones, Kyle Lafferty, Josh Magennis, Jamie Ward, Conor Washington, Liam Boyce, Will Grigg.